I have seen some military leaders succeed in the corporate world, and I have seen some fail. If the ones who failed behaved the same way in the military, they were likely failed military leaders too. I’ve also seen great corporate leaders who might have done just fine in the military. My eleven-year military career is a distant memory now, but I remember what my father told me when I decided to leave, “You’ve been taught how to be a leader.” His insight came from his own 25-year military career. 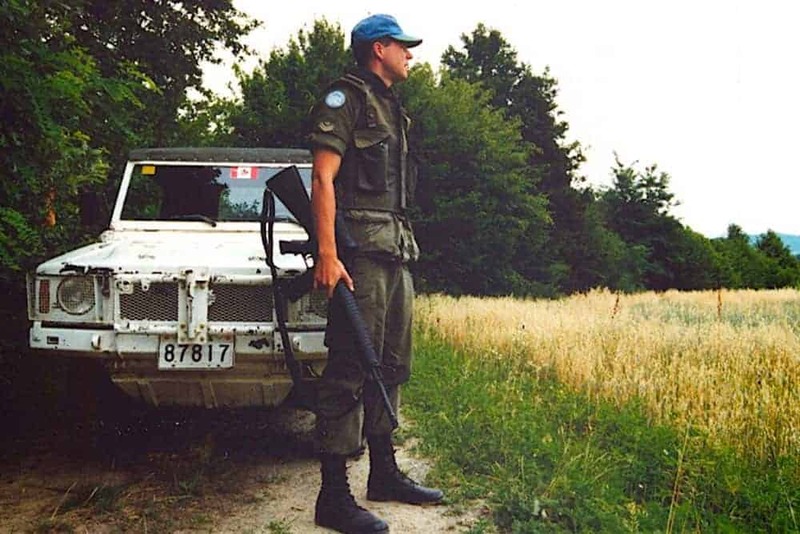 Me in 1993 on patrol in the former-Yugoslavia. So why do leaders fail? The military taught me that they often fail because they are unskilled in the use of power in leadership. Power in organizations is the capacity to influence from one or more bases of power. Legitimate power is based on our place in the organizational structure; the higher up we are, the more legitimate power we have. As technology becomes more complex and pervasive, organizations are increasingly managing expert and information power; experts are powerful because they possess skills and knowledge critical to the success of the organization. If we follow people because we admire them, then they have referent power. Lastly, when we follow people out of fear or only to gain some reward, they have coercive or reward power, respectively. Leadership is also a capacity to influence, but without reliance on one or more bases of power. If you are a leader in an organization, ask yourself this question: Would the people who report to me still do their best work if I wasn’t their boss, wasn’t an expert, if they didn’t admire me, if I didn’t force them, and if I couldn’t reward them? If your answer is yes, then you are a perfect leader of a perfect team. Instead of a definite yes answer to the question above, hopefully your answer was that most people would still do their best work. That’s how good leaders answer, and how poor leaders answer when they are kidding themselves or too embarrassed to be honest. Good leaders rely less on power because they are skilled at two key leadership behaviors: spotting top performers and getting out of their way; and understanding how everyone needs to be supported and making sure they get that support. Even your top performers need support. They may want recognition, autonomy or opportunity. As a good leader, you’ll take time to get to know each of them and do everything reasonable to support them. If you want to turn an emerging top performer into a star, you’ll do the same thing. Of course, there are some people who will only respond to power. This is where your organization’s performance management practices kick in. As their leader (legitimate power) you’ll either manage them to success or manage them out of the organization. In the military, I had good and bad leaders. The bad ones used power to make everyone’s life miserable. The good ones got to know us and inspired us. In the military, people willingly pay the ultimate price in service to a good leader. Like most soldiers, I had legitimate power over other soldiers, but I learned to lead with minimal use of power. Now, as I look back on my corporate career, I believe I’ve done the same. Sometimes I’ve had legitimate power, and sometimes I was the expert with critical skills and information. However, my capacity to influence came from understanding how people needed to be supported to do their best. My best corporate leaders have done the same.